Twisted Pixel, PAX, and BrainLazy have a long history together. The Maw won an Audience Choice award at PAX10 back in 2008, and they have been a fixture at PAX East and a perennial stop for us each year when. (They also were the only recurring press and dev contacts who actually remembered one of us!) This year they showed us the current progress in their latest IP, the upcoming Lococycle. That guy really should be wearing a helmet. As is so often the case with Twisted Pixel titles, Lococycle has to be seen to be appreciated. 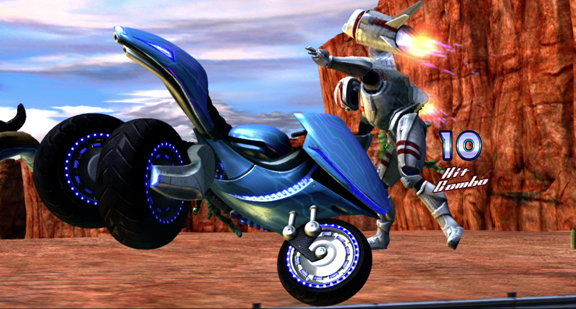 Twisted Pixel describes it as a combination Racing/Brawler/Shooter, but to hear that description you would think it would lead to a very choppy, segmented game with sections where you race, then hop off the bike to do some brawling and shooting. Such couldn’t be further from the truth. 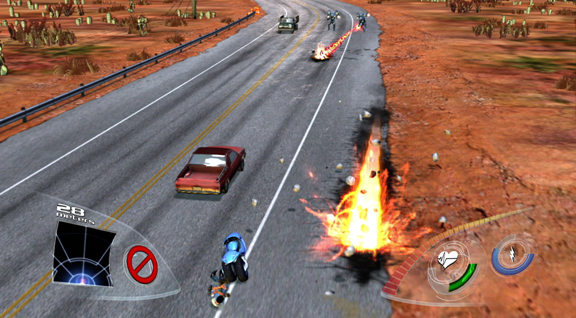 If there is one word that springs to mind when I reflect upon the portion of the game presented to us, it is “seamless.” You will go from racing along at highway speeds, unloading your machine guns into an array of enemies (and an unsettling number of innocent bystanders), then leap into the air to combo-juggle some enemy agents, then drop right back down to peel out and leave their battered husks in the dust all without missing a beat. And all as the motorcycle. 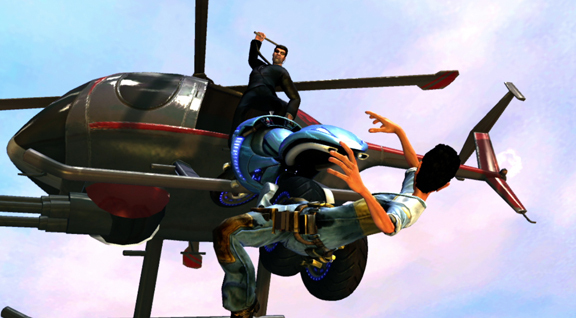 (That’s right, this is a game with a motorcycle that punches people.) The pace is breakneck and relentless. Even the periodic grades you are given for completing sections of the level are provided on the fly, with the camera zooming into the display on the bike itself to show you how you’ve done. 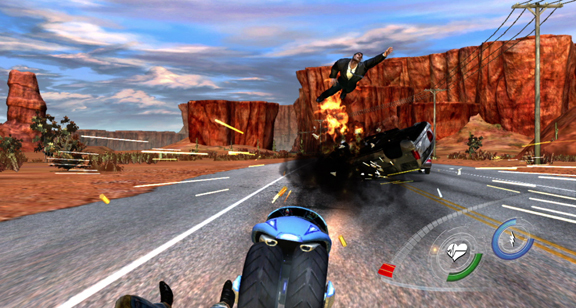 Along the way you are given some truly cinematic stunt sequences, delivered via Quick Time Events. Now as a person with the reaction time of a tranquilized sloth, I’ve often found QTEs to be game killers for me, but Jay Stuckwisch—the Twisted Pixel rep who ran the demo—said that failing a QTE doesn’t halt progress, it just hurts your score. That ought to keep the frustration level low. That said, you’ll want to nail these sections, because not only does the resulting high score provide you with the resources to purchase upgrades, passing the QTEs presents you with some hilarious slapstick and action movie goodness. That brings us to the other staple of Twisted Pixel games, the humor. If the concept of a melee fighting motorcycle wasn’t enough to tweak your funny bone, here’s the official plot. You play as I.R.I.S., a military super-weapon designed by Big Arms (a division Big Science from ‘Sposion Man). She short circuits one day, decides she doesn’t want to be a weapon anymore, and promptly escapes. In order to execute her plan for freedom, she enlists the help of her mechanic Pablo. In this case, ‘enlists’ is a synonym for ‘snags the cuff of his pants on her rear axle and drags him on his back across hundreds of miles of desert terrain. During these sections, Pablo’s mechanical skills are second in importance to his utility as a blunt weapon or boomerang. How does Pablo feel about his? Well, throughout the level he was screaming protests in Spanish, but thanks to a faulty translator, I.R.I.S. thinks he’s having a wonderful time. The result can be viewed as a sort of demented buddy comedy from one angle and a horrifying hostage situation from another. On top of the premise, the presentation is equally absurd. Big Arms, the massive military-industrial behemoth that created I.R.I.S., is just as likely to attack with hatchets and cleavers as they are to fire missiles and lasers. 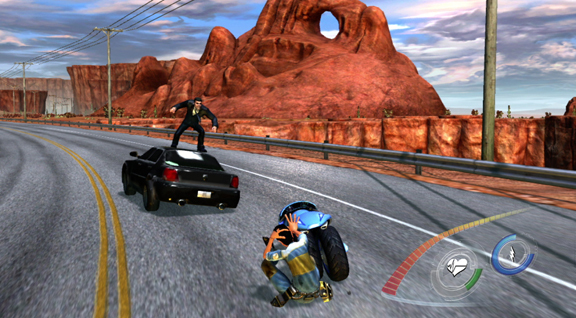 At one point, when wall-riding to avoid an enemy, a jetpack wearing agent starts blasting buses and cars off the road to send them tumbling down the cliff to get you. The oh-so-important pop culture references are in full force as well, with a pair of enemies on motorcycles earning the label “Road Rashers.” Overall it isa Twisted Pixel game through and through; totally original and shamelessly madcap. You know what? Helmets all around. As Jay played flawlessly through the demo, he also chatted with us about Twisted Pixel in general (showing a level of rub-your-head-and-pat-your-belly multitasking I can’t even comprehend). As with Behemoth, Twisted Pixel has not adopted the same sour opinion of Microsoft as many of the indie devs, though this is not surprising considering the fact that Microsoft Game Studios is their publisher. No doubt thanks to their proven record of critical and commercial success, Microsoft has adopted a hands-off policy with Twisted Pixel, leaving the developer to work on their own projects at their own pace without interference. That commercial success, by the way, has paid and will continue to pay excellent dividends for us gamers. They are hoping to keep with their tradition of handing out free goodies with their titles, and likewise they continue to make awesome doodads to show off. An honest to goodness marionette of the Gunstringer was cool enough, but this time around they had actual, factual custom motorcycles made of both I.R.I.S. and S.P.I.K.E. (your evil counterpart in the game). The work was done primarily by a local custom bike shop, with some finishing touches applied by Legacy Effects, the same visual effects group who provided the special effects for Alien and Predator. Though the standard operating procedure for the big studios has always been to cling to an IP until it has been sucked dry (then reboot it and milk it a little more), Twisted Pixel remains more interested in coming up with new and interesting concepts each time. (Often springing from the most bizarre inspirations: Gunstringer came from a last minute scramble for an idea in a Mexican restaurant, and Lococycle came from a dream after watching Torque.) This has provided them with a potent roster of memorable characters, but while Jay admitted something like a mascot racer or Smash Bros.-style fighter might be fun to do if they had all of the time in the world, for now they are too busy working on finishing Lococycle (which is slated for a 2013 release) and developing the next title in the pipeline (which is too early along for anything resembling an announcement).